Are you using Vehicle Reflective Tape Correctly? Since new regulations in 2011, it is essential that you correctly utilize Reflective Vehicle Tape to avoid a serious legal dispute and keep your vehicles and staff safe. Call 01268 768 768 for more info! Home / News / Product News / Are you using Vehicle Reflective Tape Correctly? Are you using Vehicle Reflective Tape Correctly? The regulation was introduced in 2011 for all newly registered HGV's. If you own, operate or service any goods vehicle over 7.5 tonnes or trailers over 3.5 tonnes you need to know about this legislation and act accordingly to avoid serious consequences, specifically in the event of an accident! 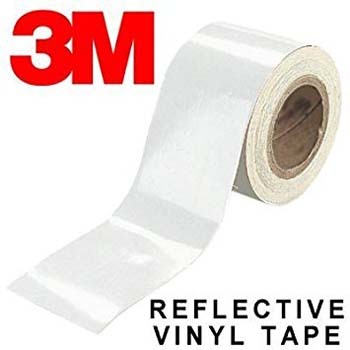 3M Scotch Lite Diamond Grade Retro Reflective Vehicle Marking Tape helps to reduce accidents and save lives. Improving safety and increasing visibility of vehicles. Massively reducing accidents which in turn means less time and money spent on repair costs and even legal matters. using the correct Vehicle Reflective tape inline with current regulations (law) will protects your company against potential legal action related to third party safety in the event of an accident. Suitable for application on curtain sided vehicles and rigid surfaces. This Reflective Vehicle Tape will help to reduce the likelihood of a vehicles being involved in accident due to lack of visability. The micro prisms within the Reflective Vehicle Tape will catch light from more angles than standard reflective tape making it far more visible. © 2019 PackRight, all rights reserved worldwide.